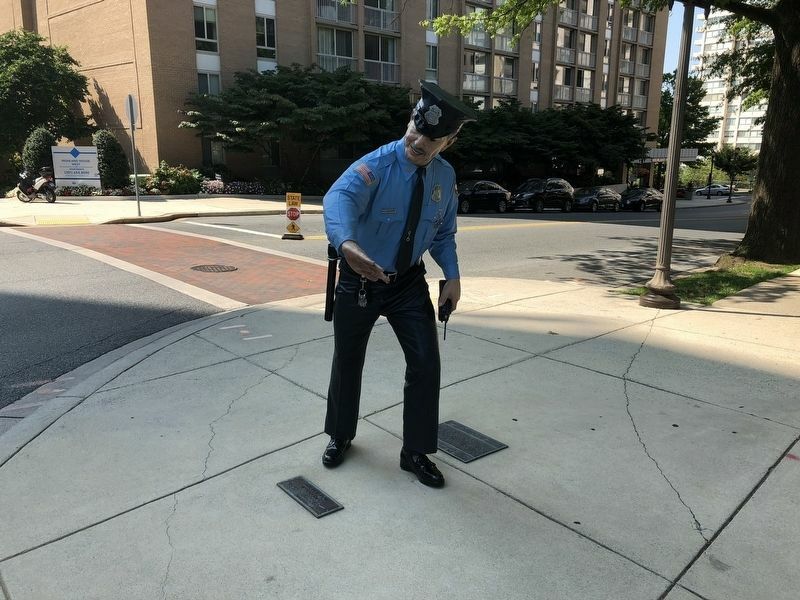 by J. Seward Johnson, Jr. 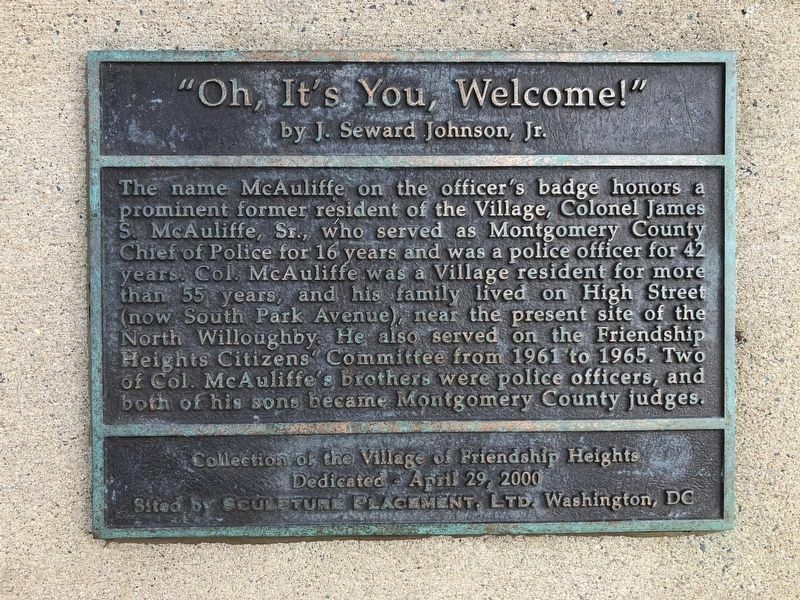 The name McAuliffe on the officer's badge honors a prominent former resident of the Village, Colonel James S. McAuliffe, Sr., who served as Montgomery County Chief of Police for 16 years and was a police officer for 42 years. Col. McAuliffe was a Village resident for more than 55 years, and his family lived on High Street (now South Park Avenue) near the present site of the North Willoughby. He also served on the Friendship Heights Citizens Committee from 1961 to 1965. Two of Col. McAuliffe's brothers were police officers, and both of his sons became Montgomery County judges. 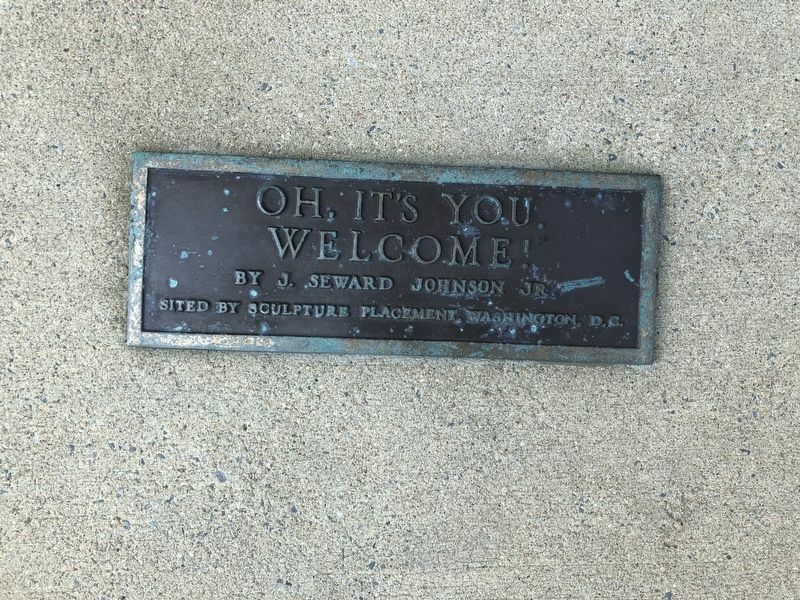 Erected 2000 by Village of Friendship Heights. Location. 38° 57.805′ N, 77° 5.297′ W. Marker is in Friendship Heights, Maryland, in Montgomery County. Marker is at the intersection of The Hills Plaza and South Park Avenue, on the left when traveling north on The Hills Plaza. Touch for map. Marker is at or near this postal address: 5500 The Hills Plaza, Chevy Chase MD 20815, United States of America. Touch for directions. 2. "Oh, It's You, Welcome!" (approx. half a mile away); One Hundred Years a Town (approx. half a mile away); Fort Bayard (approx. half a mile away in District of Columbia); Colonel Joseph Belt (approx. 0.7 miles away); A Man's Recollection (approx. ¾ mile away in District of Columbia); Luis Alves De Lima E Silva (approx. one mile away in District of Columbia); Early Commerce (approx. one mile away in District of Columbia). More. Search the internet for "Oh, It's You, Welcome!". Credits. This page was last revised on March 19, 2019. This page originally submitted on August 26, 2018, by Devry Becker Jones of Washington, District of Columbia. This page has been viewed 63 times since then and 12 times this year. Last updated on September 23, 2018, by Devry Becker Jones of Washington, District of Columbia. Photos: 1, 2, 3. submitted on August 26, 2018, by Devry Becker Jones of Washington, District of Columbia. • Andrew Ruppenstein was the editor who published this page.